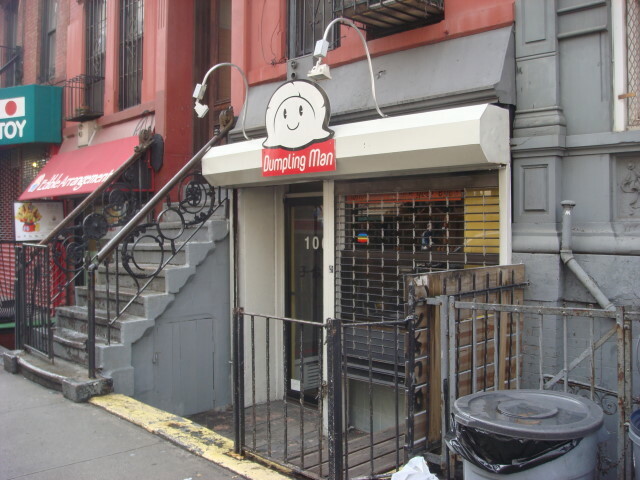 In the Lower East Side, just down St. Marks Place, sitting on the south side of the street; is a little slice of perfection: Dumpling Man! If you read reviews of Dumpling Man, you’ll note they claim they make the dumplings right in front of you. True, but not the truth. They make scores, even hundreds, of dumplings in front of you; but when I was there they tossed my pre-made dumplings into the cooker while they were rolling and setting up the dough flats in preparation of making more hundreds of dumplings. And mighty fine dumplings they are. Mighty fine dumplings. My advice (take it for what it’s worth); run to Dumpling Man and grab a mess o’ them. But just use the soy sause and the chili sause that’s out for all to use. I didn’t have much use for their extra charged “super hot” sause. It wasn’t anywhere as good as the chili and soy combo I combined and scarfed down at the counter. I wimped out inside. I asked if I could take a picture of the place and the woman making the dumplings said she didn’t want her picture taken. I shoulda anyway. She makes a fine dumpling and should be proud of it. This entry was posted on March 20, 2008 at 4:48 pm and is filed under Food, LES, Manhattan. You can subscribe via RSS 2.0 feed to this post's comments. You can comment below, or link to this permanent URL from your own site. 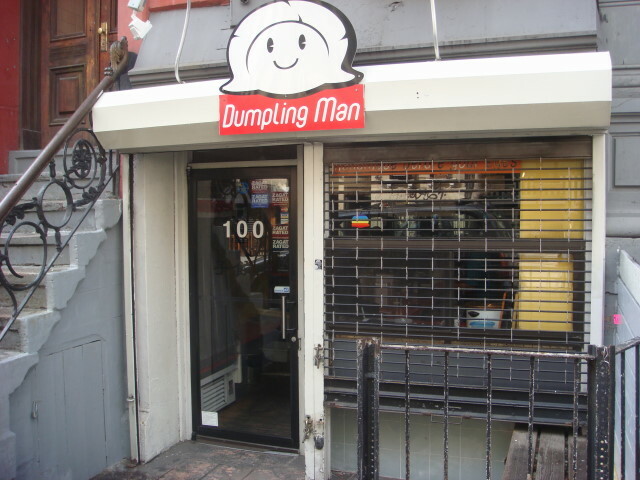 Hope the Dumpling Man is still around when I get back to NYC. I’d love to stop in and try one. Its nice that with high speed all your photos come up and come up fast. At least this part of my life has gotten easier…..